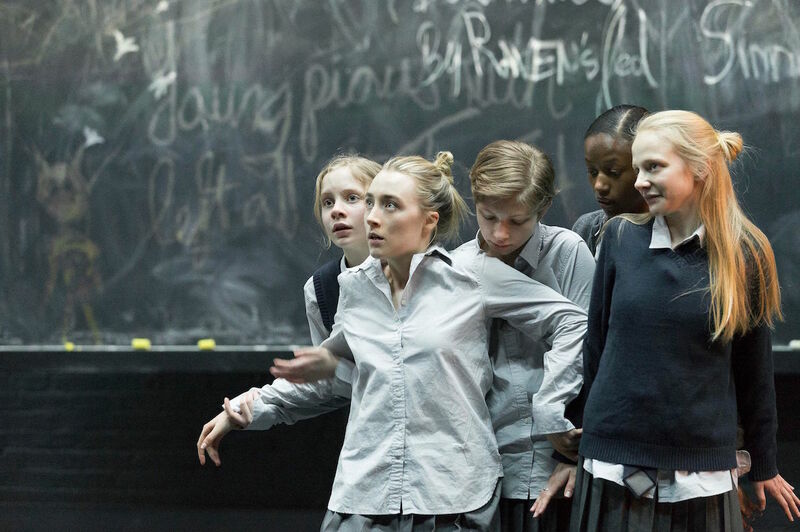 Ivo Van Hove’s The Crucible, which is his second gig directing an Arthur Miller classic play on Broadway (the first being A View from the Bridge), sets him firmly in the minimalist camp of letting the actors speak for themselves. At the Walter Kerr Theatre, a wooden stage faces the audience, first hosting a classroom in which school girls pretend to be demonized, their backs to us. Upon those backs, rest gray uniforms and other characters walk on and off the platform, in equally drab knits that could represent any age. This play is supposed to be set in 17th century Salem, when the witch hunts were on. Since the play’s debut in 1953, parallels have been drawn to The McCarthy Trials of the 1950’s, Miller’s real inspiration for this tale of betrayal and interrogation. Doers of good and evil played by several with marquis names — Oscar nominated Saoirse Ronan as Abigail, Tony winner Sophie Okonedo as Elizabeth Proctor, and fashion blogger turned impressive actress, Tavi Gevinson as Mary Warren — embody hell, heaven, and purgatory right there on the stage. All three are stellar, especially Okonedo. As the wife of farmer John Proctor (played by a bit less strapping but more metrosexual Ben Whishaw) Okonedo exudes an exquisite vulnerability. She’s faced with the constant memory of her husband’s adultery with Ronan’s Abigail, the servant fired upon that suspicion. This servant, a young girl, who has beguiled her peers into admitting having actually danced with the devil, becomes Svengali to a hunt that lands the women of the town on trial as witches. Ronan, for all her Irish warmth offstage, becomes cold, calculated, and seductive in this role. Whishaw, whom at first may seem ill suited to play a rugged man of the earth that once gave in to his desires, really shines in his scenes with Okonedo, especially in the final act of confession and surrender. Still, The Crucible rests as an ensemble piece and all of them fit well into place in this production. Jim Norton is wonderful as Giles Corey, a true man of his word who feels enormous guilt for complaining about his wife reading so many books, enough to cast suspicion that she might have been reading to conjure spells. Reverend John Hale (Bill Camp) perfectly pitches manly vocal statements of logical reason, the kind that the “lecherous” Whishaw guiltily initially cannot. Yet, it is only Nurse Rebecca (Brenda Wehle), who is also jailed for witchery, that foresaw the whole mess likely reflected teenage pranks and not Satan. 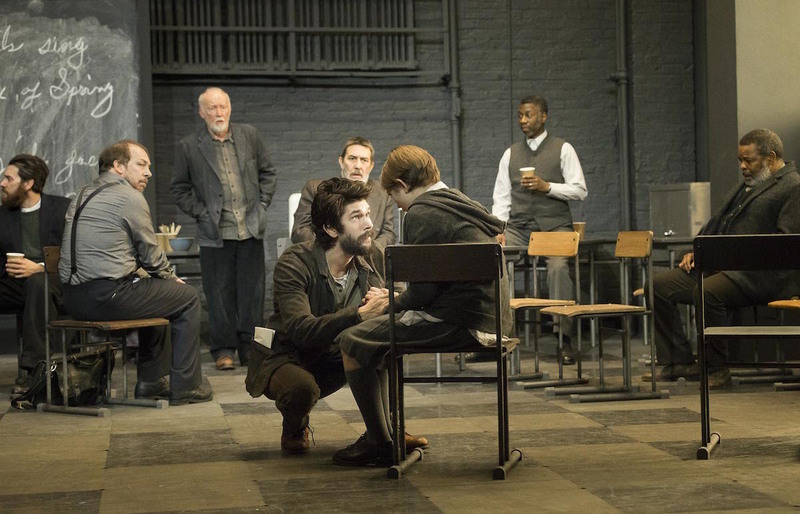 Whatever the era, The Crucible exposes how mob coercion can brainwash the innocent or bring them to their knees. Each of us is a bit guilty – some more, some less – which brings me back to this staging. No elaborate set decor, sentimental, nor symbolic nuance will distract you. However (spoiler!) a live wolf does cross the stage in the production at some point. With the exception of the close of the first act, where the girls, practically hypnotized by Abigail, name names to Phillip Glass’ haunting composition, Von Hove’s interpretation of The Crucible remains a straightforward dialogue between thespians and witnesses. 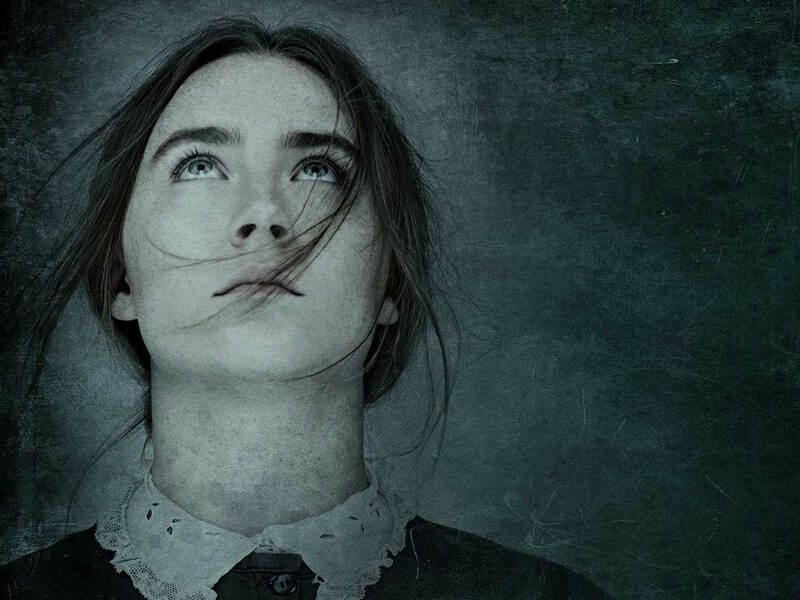 The Crucible, runs April through July 17, 2016 at the Walter Kerr Theatre, 219 West 48th Street, New York City.